Using a special launcher, you fire colored bubbles in an attempt to make matches and dislodge a plate at the top of the screen. After dropping the plate, you advance to the next level. The game ends when the bubbles get so piled up that they reach the bottom of the screen. 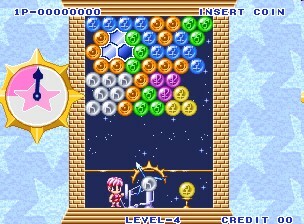 The game is similar to Bust-A-Move, but as well as having to link three or more spheres of the same color together to eliminate them, you have to clear all the spheres away from a “plate”, which drops down when the supporting spheres are destroyed. While playing against an opponent, if more than three spheres are removed at once, they will be added to the collection on the other player’s screen. Clearing spheres more than three at a time produces a big bonus. This is possible by building up two groups of two, of the same color, and then linking them to make a five-sphere clearance.